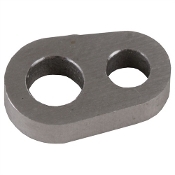 Fully machined from solid Alloy Steel, these premium-quality links are critical for ensuring you have the precise amount of vertical lockup needed for best accuracy from your pistol. Heat Treated and de-stressed. .283" center to center, This is the standard Colt spec.